What is the memory address information I should plug into IDA for this BIN file? This BIN file contains the low level board initialization, SDRAM clocks, power, Interrupt Controller, LCD, duart, and more. I need the values passed to the LCD, duart and other to know what exact hardware my board uses and to know if firmware for an earlier board will work on a later board. Part of the this BIN file is loaded into the on chip RAM (OCRAM) for minimal board init. This code is executed and will init the rest of the board most important for this question the SDRAM. More of this BIN file will load into the SDRAM then execute and init the rest of the board. This BIN will then load and pass control to the OS. Here is a simple example of this using my custom u-boot and kernel. Oversimplified and information removed for brevity. Actual BIN file info. This is part of the memory map for this μP. The μP is a Freescale mx23 or imx233. In the “Disassembly memory organization” dialog I am unsure what to set. Is the RAM section my SDRAM, 0x40000000 - 0x01000000? Is the ROM section my OCRAM, 0x00000000 - 0x00007FFF? What about Input file loading address, file offset, loading size? Would the loading size be the 16MB of my SDRAM? Where does the peripherals addresses go? Yes, this is correct. But AFAIK not too important. IDA will create different segment for different code parts based on this input, but will handle fine which ever values are entered. Yes, this is again correct but again AFAIK it's not too important. for low-level code executed, and especially for boot loaders, the loading address should be specified in the chip's datasheet. Yep. 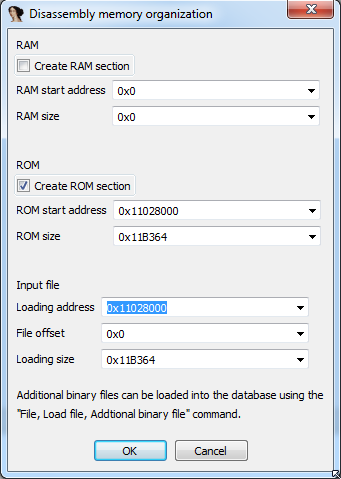 IDA will add the RAM address space as an additional segment for you. IDA doesn't explicitly support peripherals, you'll need to include those in your RAM definition or create a different segment manually after the file is loaded. You'll need to manually specify what peripheral is exposed at each address either by adding different segments for different peripherals or by creating and naming variables/structures. Not the answer you're looking for? Browse other questions tagged ida disassembly arm memory or ask your own question.